Cyprus is an island of 3,571 square miles: it less than two-thirds the size of Connecticut and includes fewer people than live in my hometown of Austin. The population is around 1,088,000, but no one knows for sure because political controversy has prevented an official census for decades. 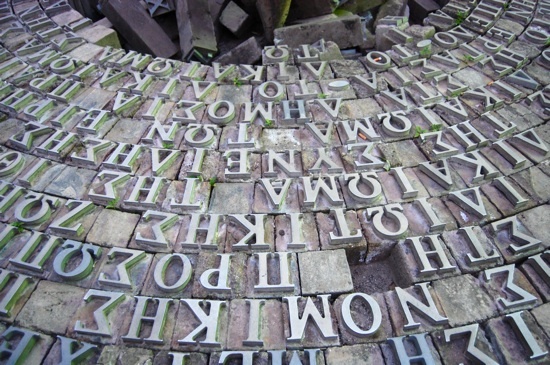 On an island where news is slow, history is very much alive. In fact, sometimes it seems like the only news is rehashing the history. Any discussion of the current political situation begins with the speaker’s version of a centuries-long saga over the rights to a piece of the island. By 1500 it had been ruled by the Greeks, the Byzantines (Eastern Romans), England, the Knights Templar, the Lusignans, the Republic of Venice. Genetic testing shows native Cypriots today have more in common with Italians than they do with people from Greece or Turkey, two major players in the current division. In 1570 the Ottoman Turks took over the island, and in 1878 it was leased to the British Empire, who took over full colonial control in 1923. Britain had two military bases on the island, which it maintains to this day–one is also used by the United States–because of their strategic location from the time of the World Wars to now. During the Cold War, Britain sent U2 spy planes from these bases to monitor the southern Soviet Union, and in the past few decades they have become strategic monitoring centers for the Middle East and North Africa. Britain still owns 3% of the land on the island for military purposes. Local histories of the island include varying amounts of the above information. They all include the following: beginning in the 1950s, a movement among southern Cypriots resentful of British rule called for enosis, or union with Greece. 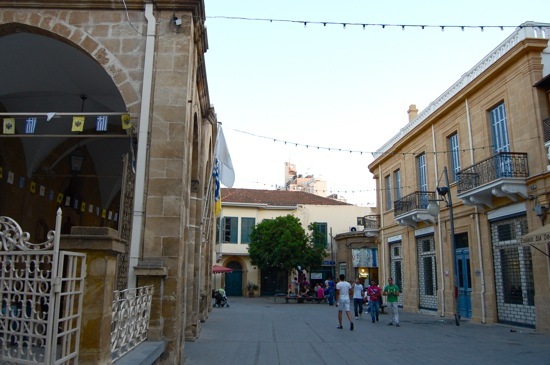 At this point Cypriots of Greek and Turkish origin lived in mixed communities throughout the island, although there were a majority of Greek Cypriots in the south and Turkish Cypriots in the North. 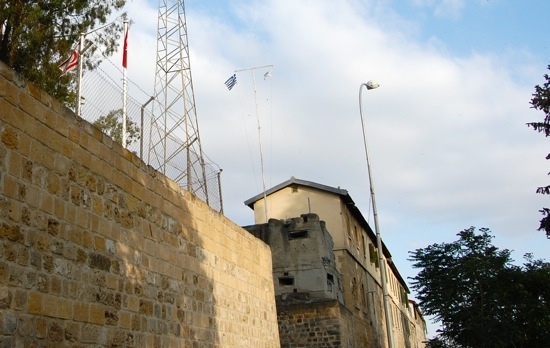 The enosis proponents founded a military group called the EOKA (Greek for National Organization of Cypriot Fighters); in concern of losing its stake in the island Turkey sponsored the formation of the pro-partition TMT, or Turkish Resistance Organization. In 1960 fighting led by the EOKA gained independence for the Republic of Cyprus, with Turkey, Greece, and the U.K. signing on as “guarantor powers,” agreeing to protect Cyprus from union “with any other State, or the partition of the Island.” If either of these threatened to happen, they were allowed to intervene to restore the status quo. According to Turkey, this treaty obligated it to act fourteen years later when a pro-enosis military coup overthrew the president of Cyprus. In 1974 Turkey invaded from the north, and the United Nations halted fighting along a “Green Line” that still divides the country–and its capital in the middle of the island–today. North of the Green Line is an area recognized only by Turkey as the Turkish Republic of Northern Cyprus (TRNC) with its half-city capital of Lefkoşa; south of it, the internationally recognized Republic of Cyprus and its half of the same city, called Nicosia. The Republic of Cyprus was admitted to the European Union in 2003, a year before the failure of a UN-designed plan to unify the island as a federation of two states. Since then there have been four failed rounds of unification talks and no internationally approved census on the area that appears on all Greek maps void of cities and roads, with only the words “Territory Occupied by the Turkish Army.” Passage between the north and south requires getting a visa stamped at the UN Buffer Zone, which is as narrow as an alleyway in the heart of the city and as wide as a village outside. One thing northern and southern Cypriots can agree on is that Britain has a heavy hand in this mess. In the early 1950s the British sensed dissatisfaction with their rule and enlisted Turkish Cypriots to serve as police at EOKA demonstrations, creating previously unexisting tensions. When the EOKA rioted against the British and Turkish police, violent struggles broke out between Turkish and Greek populations on the island. Amongst this, independence from Britain was negotiated, Turkish Cypriots began to leave their homes in the south, and Greek Cypriots began to leave their homes in the north. Paramilitary attacks and migration–forced or voluntary, depending on who you ask–continued until the 1974 ceasefire. 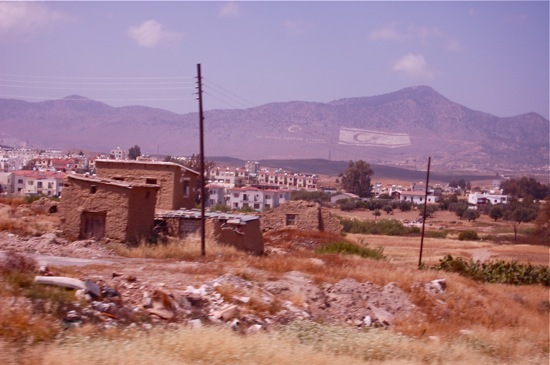 Around sixty thousand Turkish Cypriots fled from the south to the north, where Greek Cypriots went from being 80% of the population to zero. Within our current city, the famously Last Divided Capital, on one side the language is Greek, the currency is the Euro, and the official faith is Orthodox Christianity. On the other side you speak Turkish, pay with Turkish lira, and pass by mosques. We’ve been told that the TRNC is more secular “even” than mainland Turkey, a stark contrast to the powerful and state-supported Greek Orthodox Church in the south. Our research in Cyprus centers around these issues: the role of the Greek Orthodox church in prolonging “the Cyprus problem,” how invested young people are in reconciliation after almost forty years, why Turkey is sending settlers from its rural, conservative Muslim southeast to settle in northern Cyprus, and how all of this affects Turkey’s bid for accession to the European Union.